Fresh off of my soap box from last night’s long rant on Teach for America, I came home today to see that a high school student was suspended for scrawling “YOLO :)” on the essay portion of the STAAR, one of Texas’s standardized tests, and tweeting it to school officials. First off, this dude is awesome and I wish I could give him a high five. The test he was taking was completely unnecessary for him to take, a separate standardized test was his high-stakes test, yet he was forced to take the STAAR to help calibrate it for future test-takers. The same thing happened when I was in high school – freshmen took the Terra Nova (seriously, who names these things) which was merely a metric for comparisons to other schools, while sophomores took AIMS (and upperclassmen retook AIMS as needed) in order to meet the requirements for graduation. Kyron Birdine’s exceedingly mild rebellion and its consequences suggest, too, that if anything they are even more rigidly policed than they were in the 90s. I remember how each student was interpellated into the role of a potential cheater, a potential violator. Make sure you have the right kind of pencils, make sure you have extra, eyes on your own paper, also cover your paper in case someone else might look over because if someone else cheats off your paper you are then a cheater too. I don’t know about cell phones; in Virginia in the 90s they were considered evidence of dealing drugs and banned from public schools. As the Dallas Observer notes, Kyron are being forced to take both the new State of Texas Assessments of Academic Readiness (STAAR) test and the old Texas Assessment of Knowledge and Skills (TAKS) test, even though only the TAKS will count. Students in Birdine’s year were, in other words, being used as a data source to help calibrate the new test. I know I had to do this too, on the SAT–I took an analytical reasoning section, but the scores didn’t count for anything because it was new; they just collected the data and used it to calibrate the scoring. I’m sure that’s a standard procedure now as in the 90s. It disturbs me a little, though, that it’s never occurred to me before that standardized testing companies shouldn’t get to waste students’ time and collect their data for free—let alone compulsorily. Cecire identifies a serious problem here. Students are being forced to take tests that do nothing but provide testing companies with information. And they aren’t compensated, save for a late start in subsequent years, or maybe a longer lunch before periods 1-3 start in the afternoon on weird-testing-schedule-day. On top of the fact that teachers are taking more and more time away from actual instruction to dedicate to test preparation, and on top of the funding set aside for implementing these tests that don’t really serve a purpose (high stakes or not), we’re unfairly roping the students into serving as data points. With six different classes, each with their own assignments, and lives outside of school, I can think of a myriad better ways that youth could be spending this time rather than bullshitting through a test that has no effect on their lives. In closing, here’s a bubble answer sheet one of my high school students handed in last spring. It was either the back of the final or a spare sheet, I can’t recall, but in light of this latest incident it’s pretty perfect. 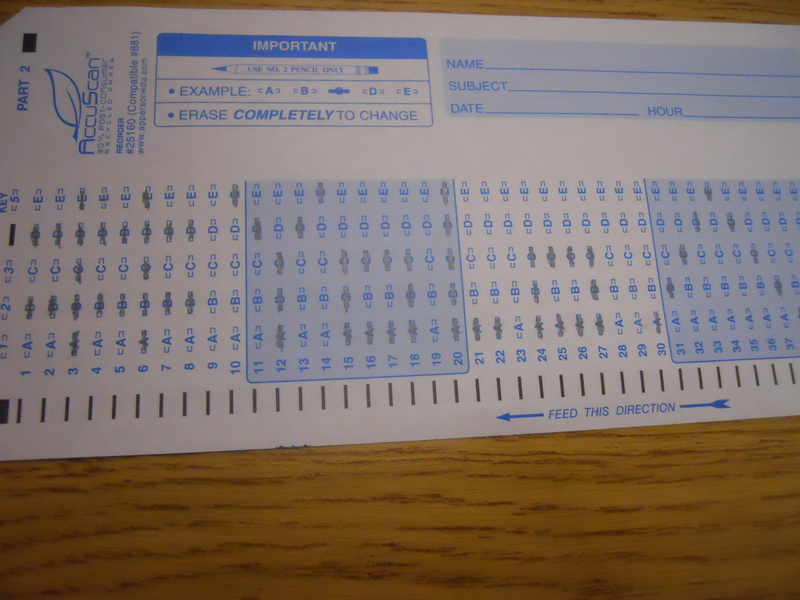 This entry was posted in Education and tagged High Stakes Testing, Public Education. Bookmark the permalink.